Some people consider mothers to be deities; they believe it is not out of place for these special people to be worshipped. The reason for this decision should not be far fetched as mothers will always go to any length in ensuring the safety of their children. Age is nothing to these women; the moment they give birth and become mothers, their roles start. This role does not end with the graduation of their children;children will always remain their parents’ babies. A mother’s love is selfless; she will travel miles on her feet if that will make her children happy. There will always be nights where she will sleep hungry in order for her children to be satisfied. Her children’s happiness comes first as nothing gives her more joy than seeing her children happy. At this point, it is important for us to make some clarifications; not all women are mothers even though all mothers are women. Now do not be confused by this; a woman who goes through labour pains and child birth does not encompass the real meaning of the word mother. What do you say about women who give birth and dump their babies in bushes and dump sites? Are they even fit to be called mothers in the first place? Motherhood is a phase many women look forward to even though some of these women are not qualified by human standards to be called mothers. A mother’s role is always sacrificial; it requires patience and understanding as they have to show their love while guiding the children on the right path. The story of Meliah Md Diah, a 101-year-old woman, will tell you what a mother’s love should be like. It is simply pure and unadulterated. 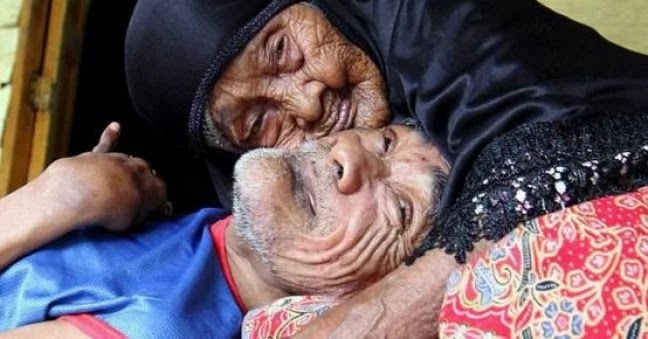 This old woman took care of her 63-year-old disabled son till she died; it is expected that a woman of that age will have issues moving round or remembering things. However, as muddled up as the thoughts of this woman could be at that age, she never forgot her son’s name. Caring for her son was the most important thing to her as she looked after his affairs till she passed on. Most women cannot be that understanding and patient when it comes to looking after disabled children. Some of these women willingly give away children that are physically fit; do you think they will want to be stuck with an invalid for the rest of their lives? Meliah Md Diah must have gone through a lot while Abdul Rahman, her 63-year-old son was younger; she must have done everything she could to make him whole and normal. 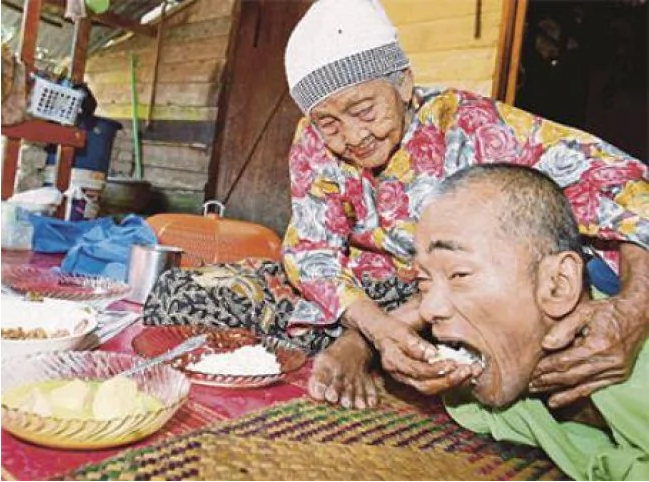 The 63-year-old son could neither walk nor talk; yet, Diah did not cast him away. Despite her fading memory, she knew she had a son who depended on her. She saw to his needs despite her age. She saw her son as a cross she had to bear; she stayed and remained devoted to him all her life. Situ Jaleha Yunus, the 101-year-old woman’s niece said her aunt had issues breathing and was immediately taken to her son. Abdul Rahman was with her as she spent her last minutes. The mother-child bond is a strong one; it is touching to know that despite the inhuman acts going on in the world, one could still get a love as deep and strong as theirs. This story will remind you of the beauty of motherhood; it will tell you of the struggles of women in other parts of the world. The picture of Abdul Rahman paying lat respect to his mother has gone viral.